Malkhaz is a Master of Leadership in Development Finance student – Intake 2017. He is also the CEO of Crystal Group, a leading micro finance institute from Georgia. My first experience with the Frankfurt School began in 2009 when I took part in the Summer Academy lectures on Microfinance Management. 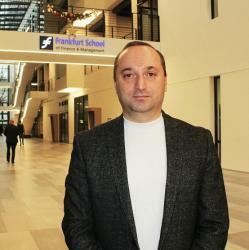 In 2013, I decided to try the new and innovative online certification programmes offered by Frankfurt School. Thus, over the next few years, I became an international Certified Expert in Risk Management, Microfinance, Microinsurance and Climate & Renewable Energy Finance. These courses have been very beneficial for my professional growth and personal development as well as for the success of my company. They have provided me with valuable knowledge and insights for improvement of my management skills, leadership capabilities and professional understanding. Later in 2017, when I decided to continue my academic career and become a Master’s student again, I had no doubts where to go. It had been more than 16 years since I completed my first degree in economics and fully engaged in practical work, building a professional career from the loan officer to the CEO of the leading microfinance institution in Georgia. I felt that I needed to update my academic background and refresh my professional skills in order to adequately respond to the challenges and improve my qualifications in the leadership and development finance area. Apart from my previous experience and long professional relationship with the Frankfurt School, the main reasons for choosing the FSFM’s Online Master in Leadership were an impeccable reputation of the institution, quality of the study, curriculum content and flexibility of the programme. This is essential for full-time workers, especially top executives like myself, in order to effectively combine work and study. It was also very nice to get a significant discount on tuition fee as a FSFM alumni and recognition of already completed e-Campus courses. The Master of Leadership in Development Finance-online programme, which lasts 2 years and gives you an internationally recognized academic degree, covers many important aspects of Strategic Leadership and Business Management. As a CEO of the company, I especially enjoyed and benefited from the modules of Leadership & Change Management and Strategy & Innovation, since they pushed me to look differently at business issues and redefine my goals. I can also say that this experience has made me more self-confident, self-critical, forward-thinking and effective in decision making which allows me to become a better leader. Additionally, I was pleased to visit the Frankfurt School campus for the two-week Extended Leadership Winter Academy where I found the environment to be very positive, professional and friendly. This module has a practical focus that offers a nice combination of state-of-the-art banking and microfinance know-how, covering topics of strategic leadership, change management, emotional intelligence etc. I enjoyed the format and content of the course where the lecturers and professors were extremely knowledgeable, supportive and encouraging, which made the whole process even more pleasant and memorable. I was also impressed by the professional attitude and high responsibility of the faculty and administration staff during the courses. And finally, my fellow students from 5 different continents were invaluable in the learning process. Their collaboration and knowledge-sharing along with the group discussions, debates and challenging assignments helped me to figure out many of my strengths and weaknesses (since I had to push myself out of my comfort zone) and gave me a better understanding of different perspectives. I have found the whole experience with the Frankfurt School highly valuable and rewarding. The new knowledge, skills and confidence I gained from this process have been transferred to my current leadership role and hopefully will lead to further progression in my company’s success and personal career goals.